The firm received “Metropolitan Tier 1” rankings in Real Estate Law and Securitization and Structured FInance Law; "Metropolitan Tier 2" rankings in Litigation-Banking & Finance; and “Metropolitan Tier 3” rankings in Banking and Finance Law, Commercial Litigation, Corporate Law, Environmental Law, and Litigation – Real Estate. 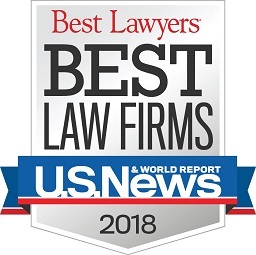 These high rankings were determined through Best Lawyers’ overall evaluation, which was derived from a combination of feedback from the Firm’s clients, the high regard that attorneys in other firms have for Mandelbaum Salsburg attorneys, and information provided by the Firm to Best Lawyers. Best Lawyers is a widely respected peer-review publication and the oldest in the legal profession. A listing in Best Lawyers is widely regarded by both clients and legal professionals alike as a significant honor. If the votes for a firm are positive enough for inclusion in Best Lawyers, that firm must maintain those votes in subsequent polls to remain on the list for each edition. The Firm has received high rankings by Best Lawyers since 2010. In addition, several attorneys in the Firm maintain Best Lawyers’ designations for their particular practices and have been so designated for several years.